Save AED 310 (31.34%) – Earn 65 Shukrans What is Shukran? Shukran is the Landmark Group’s award-winning loyalty programme in the Middle East, which allows you to earn Shukrans when you shop any of our brands. 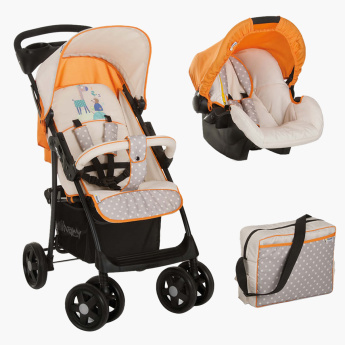 Get the best in comfort for your kid with this travel system designed to make outings and trips convenient. Secure with a five-point harness, the stroller and car seat are styled to keep your kid in a relaxed position with the safety harness and overhead canopy. The matching printed bag lets you pack in all the baby essentials.